We love tradeshows! Tradeshows provide unparalleled opportunities to discover new products, companies, ideas and innovations. Armed with my bayong a.k.a. 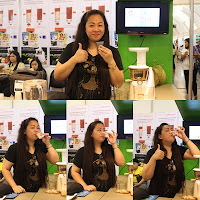 bag and umbrella, I went to the recently concluded 5th edition of PIFBEX 2012 also known as Philippine International Food & Beverage Expo, which was held in PICC, CCP Complex in Manila, Philippines last March 1 to 4, 2012. 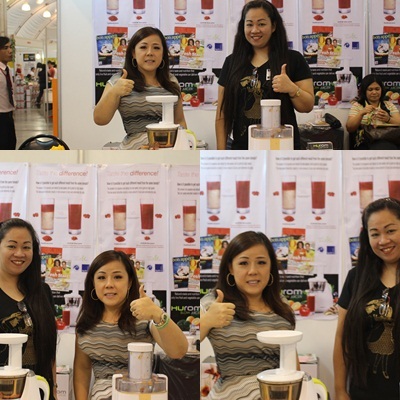 One booth that catches my attention is the Hurom Slow Juicer. 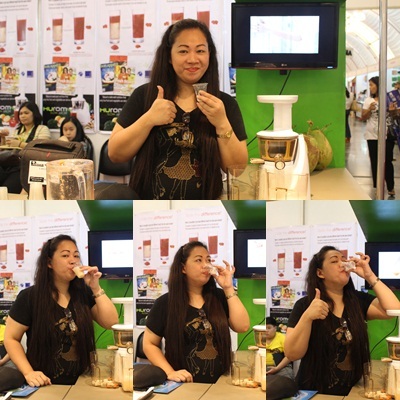 Hurom Slow Juicer does not grind or blend using high-speed but rather Hurom Slow Juicer squeezes to retrieve juice using the world’s first patented technology LSTS that allows juice to maintain it’s natural flavor, original color, vitamins, enzymes, and nutrients. 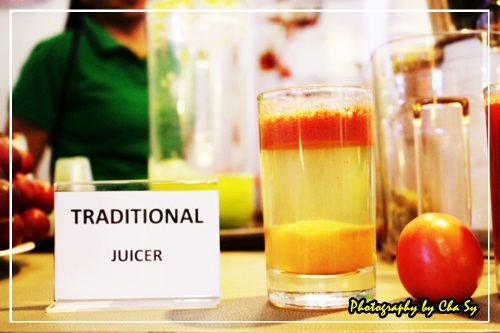 Look at the difference between the two juices. Why such different results from the same tomato? 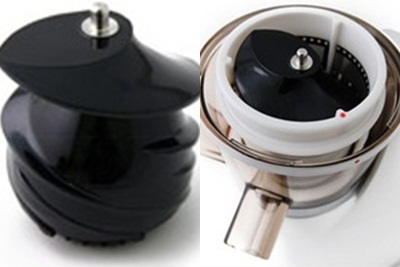 High speed from a traditional juicer builds up friction that creates heat which, in turn, damages the fruit and causes the separation from the juice. Rather than using a blade or grinder like the traditional juicers, Hurom uses it’s auger-like screw to gently press and squeeze in retrieving juice from fruits and vegetables. This allows the juicer to maintain the all natural flavor, original color, vitamins, enzymes and nutrients of the fruits or vegetables. 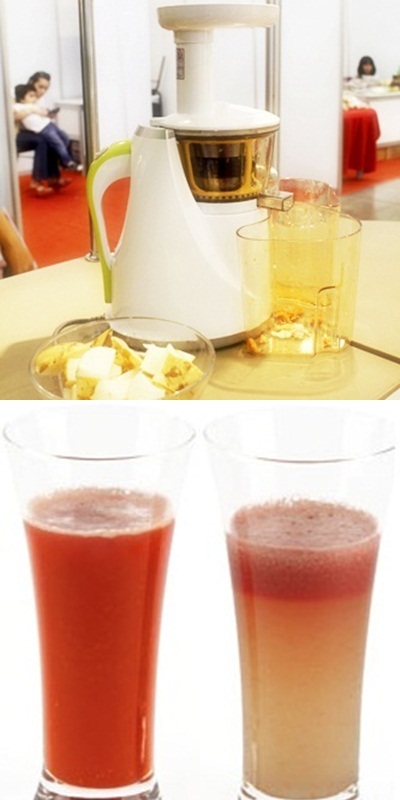 Due to LSTS, Hurom is able to retrieve fresh juice without any heat damage or friction damage. This is fantastic! The juice is definitely worth the squeeze with this juicer. You just need to learn how to work it right. The juice is very very high quality stuff! Economical. Tipid sa kuryente 150 watts lang ang electric consumption. Easy to use.Yes, siree, no need mag pwersa para itulak ang fruits para ma juice. Shoot ka lang ng shoot ng sliced fruits. Even a 3-year old kid could operate this juicer. It's a fairly user-friendly juicer. Easy to clean. Yes. Hassle-free cleaning. Buhusan mo lang ng tubig sa pinag sho shootan ng fruits, ayos na! Low Speed for Maximum Nutrition and Taste. Very Nutritious Juice. 5x more Vitamin C.
Continuous Extraction System. Not only Hurom can make the perfect juice, it can also be used in making organic tofu, soup, porridge, ice cream, sorbet, cake, chips, cookie, and many more baked goods. Efficiency with style. Hurom is designed in such ways that it does not have any sharp edges which allows a safe usage for anybody. Note: If you stick too much stuff in the juicer too fast and you don't add something to lube it out after, the juicer may get clogged. So, make sure to only gradually add fruits, so that the juicer won't clog. Available na daw po yan sa Rustan's sabi ng nag demo. All of those juicers look pretty good! There are a lot of different kinds that you can get. It's amazing to visit this website and reading the views of all friends concerning this article, while I am also keen of getting familiarity.